The Real Madrid defender was targeted by a section of the crowd in the Club World Cup final. Real Madrid captain Sergio Ramos. 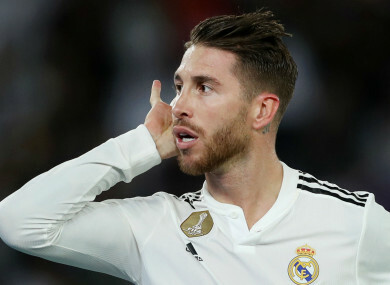 REAL MADRID CAPTAIN Sergio Ramos blasted the jeers directed at him from sections of the Abu Dhabi crowd in Saturday’s Club World Cup final as “inexplicable”. Madrid ran out comfortable 4-1 winners over locals Al Ain, as Luka Modric, Marcos Llorente, Ramos and a Yahia Nader own goal did the damage and saw Los Blancos win the competition for a third year in a row. But one consistent element of the game was the treatment afforded to Ramos, who was jeered throughout by the crowd. The Al Ain fans are believed to have singled Ramos out for his role in Mohamed Salah’s Champions League final injury last term. But Ramos sees no acceptable reason for the boos and slammed those jeering for a lack of respect. Email “Sergio Ramos slams 'inexplicable' Abu Dhabi jeers”. Feedback on “Sergio Ramos slams 'inexplicable' Abu Dhabi jeers”.